Three more Members have joined the People’s National Congress (PNC) Party. Patrick Basa, Minister for Fisheries and Member for Kabwum, Bari Palma, Member for Kerowagi and Joseph Yopyyopy, Member for Wosera-Gauwi, joined PNC at the Party’s caucus meeting last night. “The Honourable Patrick Basa had been the Leader of the Party Leader of Christian Democratic Party, and has been released by his party to join PNC,” said Prime Minister and PNC Leader, Peter O’Neill, in a statement. “The Honourable Bari Palma has resigned from the PNG Party in Opposition, to join PNC. “The Honourable Joseph Yopyyopy, was the party leader of one of the nation’s oldest political parties, Melanesian Alliance. O’Neill said political stability is essential for good and stable government, and to ensure business and investor confidence. “We are demonstrating to the nation and to the international community that Papua New Guinea is into the most politically stable period in our history. “We are now in our fourth term of Parliament with only one change in leadership, and our Government continues to strengthen our political base,” stated the PNC leader. “We are a stable Government with clear and articulated policies that are working, that are bringing about positive change in our country. 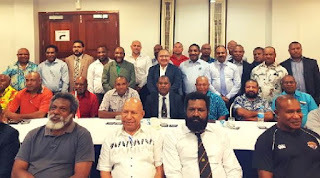 PM O’Neill further announced that the PNC Party caucus has elected Job Pomat, Speaker of the National Parliament and Member for Manus, as the Deputy Leader of PNC Party. “I welcome the election of the Honourable Job Pomat as Deputy Leader, a most dignified and hardworking Member of the Parliament and the Speaker of the House. The Prime Minister formally welcomed the three new members to PNC and said he looked forward to working with them to strengthen communities and enhance lives in their districts.